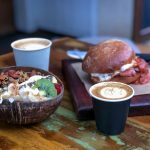 First there was the Granola Bowl, then the Smoothie Bowl and its close cousin the technicolour Açai Bowl, followed by the Nourish Bowl and the Buddha Bowl. All of them one bowl meals with a healthy lifestyle following. 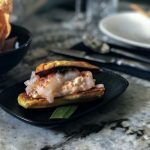 They are some of the most Instagrammed foods you will find on your feed for their picture-perfect presentation, attention to detail, layering of textures and bold palettes. 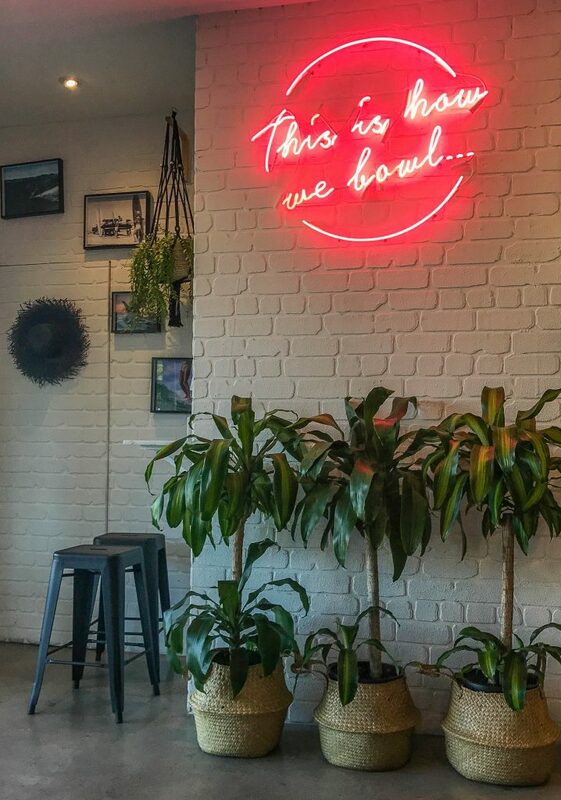 Allow me to introduce the Poké Bowl (pronounced Poh-kay), now being served at Finn Poké Byron Bay, a cute café dedicated to serving nothing but these wholesome one bowl wonders to a faithful following. 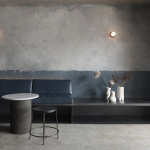 You’ll find Finn Poké Byron Bay on Fletcher Street, in a quirkly little light and bright shopfront with neon signs, macramé plant hangers and nestled nooks for dining inside with marble topped crate tables and stools for footpath dining. The staff at Finn Poké are energetic and helpful and it’s a great place to call in for lunch off the beach or for a light and tasty dinner. So, what is a Poké Bowl? ‘Poké’ is the Hawaiian name for diced and marinated raw fish. In times past, Hawaiian fisherman would chop up the offcuts of their catch and eat them raw, seasoned with just salt and seaweed – that’s where the name originated. The Poké Bowl is a modern hybrid of this traditional way of eating fish combined with delicious Japanese flavours. Poké Bowls generally feature raw fish and vegetables with additional ingredients such as rice, soy and sesame. At Finn Poké all bowls are priced at $15.95 (add one dollar more for the Tuna version). The fish is sashimi grade and super fresh. There are two ways to make your Poké Bowl order. 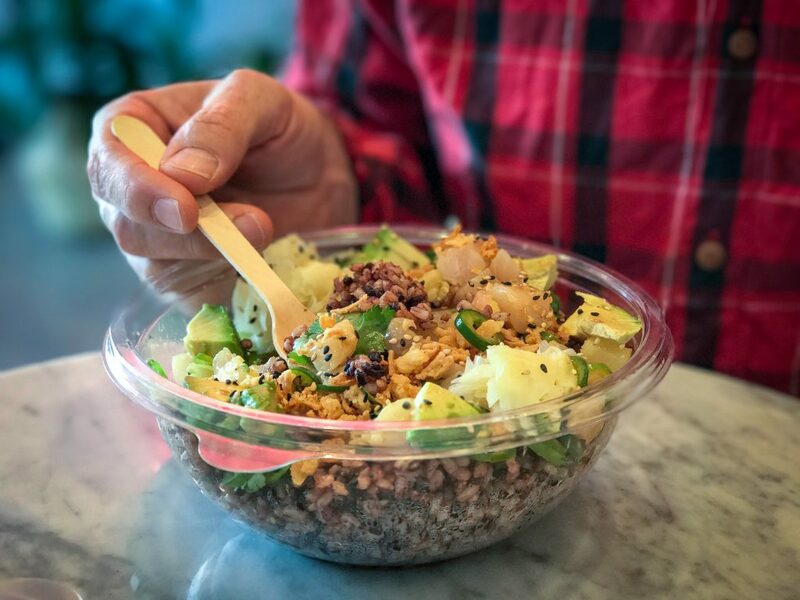 You can choose from Finn Poké’s Signature Bowl or Craft Your Own Bowl menus. 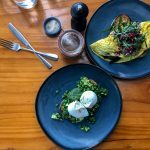 The advice is to stick with the Signature Bowl menu initially, so as not to come unstuck by combing a mish mash of flavours and ingredients that don’t work together. 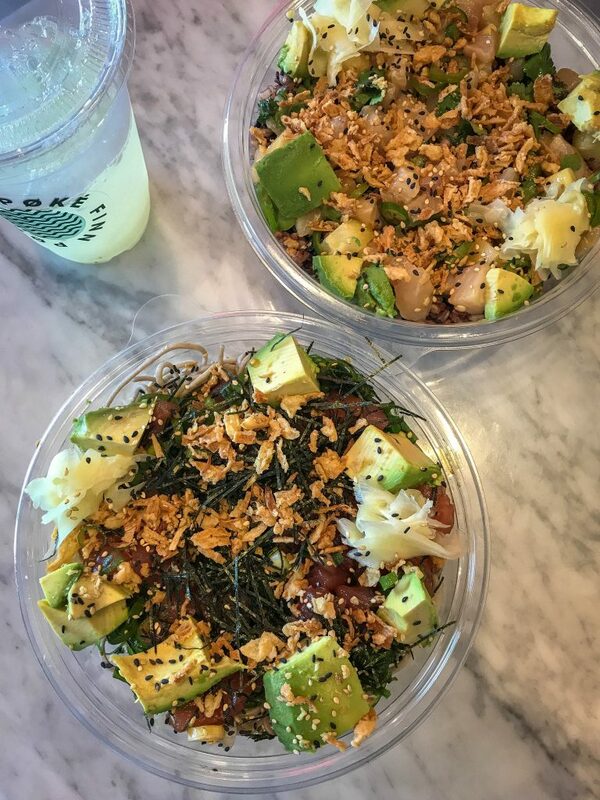 Each Finn Poké Signature Bowl starts with a base – you choose from rice, buckwheat noodle or citrus Kale salad. From there, Finn Poké has curated a delicious menu of flavour combinations. The Big Katuna is a classic featuring local tuna, roasted nori, pickled ginger, seaweed (wakame) salad, crispy onion and a shoyu dressing of soy, honey and sesame oil. I enjoy this one served on the buckwheat noodles. The King (pictured at the start of this post) is also a delicious flavour curation, featuring kingfish, jalapeno, pineapple, pickled ginger, coriander, crispy onion and a spicy yuzu citrus dressing. It is fresh with a Hawaiian bent. For vegetarians, there is The Vego bowl, which features tofu, or Dr Beet with a roasted beetroot and orange salad. You can also add extras to any bowl, such as avocado or traditional tobiko caviar (flying fish roe). If you choose to Craft your Own Bowl you have to make six decisions on what to add – yikes! So there is plenty of room for error for the uninitiated. You pick the protein, the sauce, the base, the vegetable / fruits, the herbs and spices and the crunch. Have fun experimenting and let me know when you pick a winning combo! I have to say that the fish at Finn Poké is absolute quality – you won’t find any better. The bowls are generous to say the least and what I love is that the dressing and flavours go all the way through the dish. Even on your last mouthful there, is still fish and sauce and vegetables, not just the base. If the bowl is too big to finish in one sitting, you can have a lid to take the leftovers with you. To drink, there are house made offerings like the Pineapple and Mint blend above or try some local Byron Bay Beverage Co. cold brew on tap. 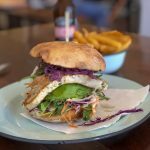 Finn Poké Byron Bay is a lifestyle café that will appeal to many. They are serving fresh, wholesome food where quality ingredients are key. I can sense that it’s going to über popular during the warmer months especially. 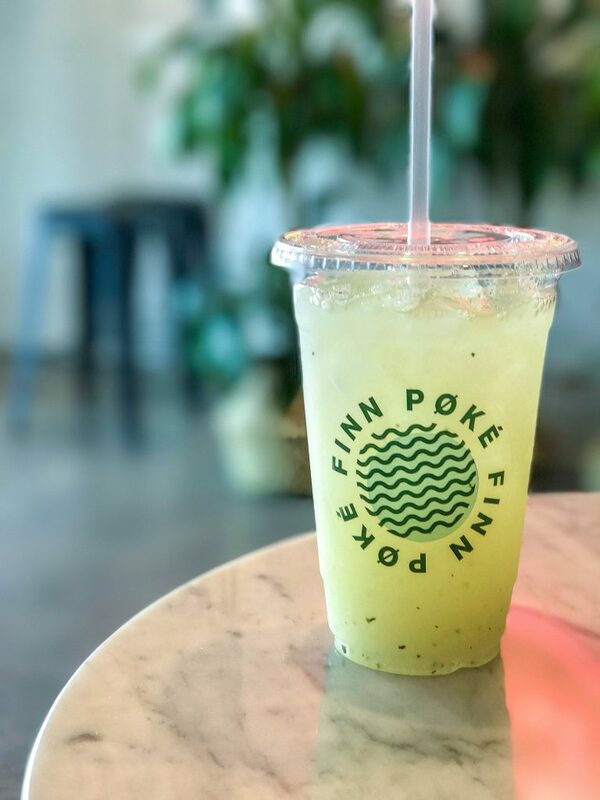 Finn Poké is open seven days for lunch and dinner and you can dine in or take away. 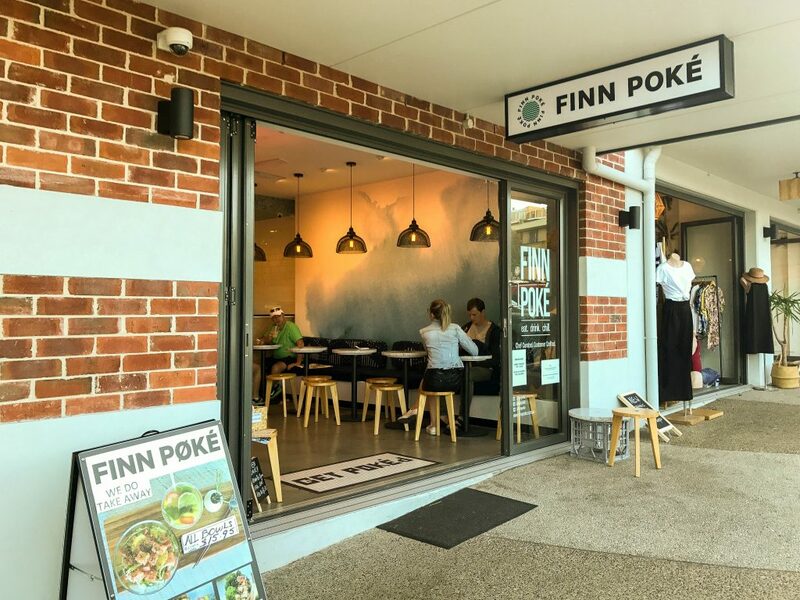 If you like the look of Finn Poké Byron Bay, try our Poké Bowl Recipe from the archives!